Most sites visited in this research study represented a “type” of business, including cafes, a car wash, t-shirt company, sock company, a doll re-sale store, etc. What is unique about Big Al’s is that it is actually a collection of many things. In mother, Joanna’s words, “It is a collection of activities I have pulled together for my son in his adult life,” including a more “traditional job” one day a week job at Orchard Supply Hardware (sweeps, waters plants, takes cob webs down), volunteer work at a senior center serving lunches, and working in a food pantry. 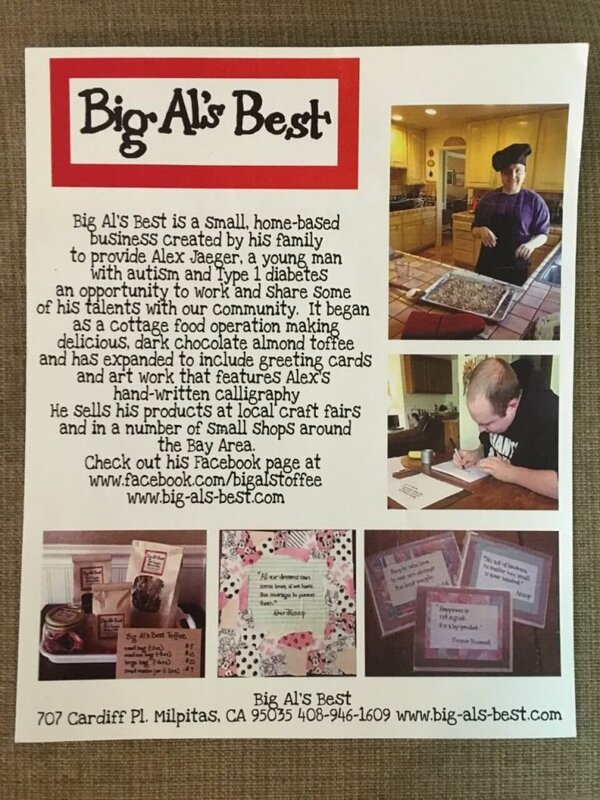 Al and his mom also make and sell toffee treats out of their home kitchen; they also make greeting cards (which they sell to local stores on consignment), and they do calligraphy for cards. In addition to the toffee and cards, Alex can also do small jobs like paper shredding, making deliveries, labeling or stamping bags. He does his best when he works for short amounts of time (1-2 hours) and most of the time has the support of a parent or support staff so they can be pretty flexible and look for many little opportunities around their community. Mother, Joanna observes, “Once school ends, there can be almost nothing —waiting lists, no programs, they just go to the food courts to hang out or sitting in front of computer or video games all day.” She tried to continue with as much structure as possible even after school ended. To be sure that he had something to get up for and to do every day. 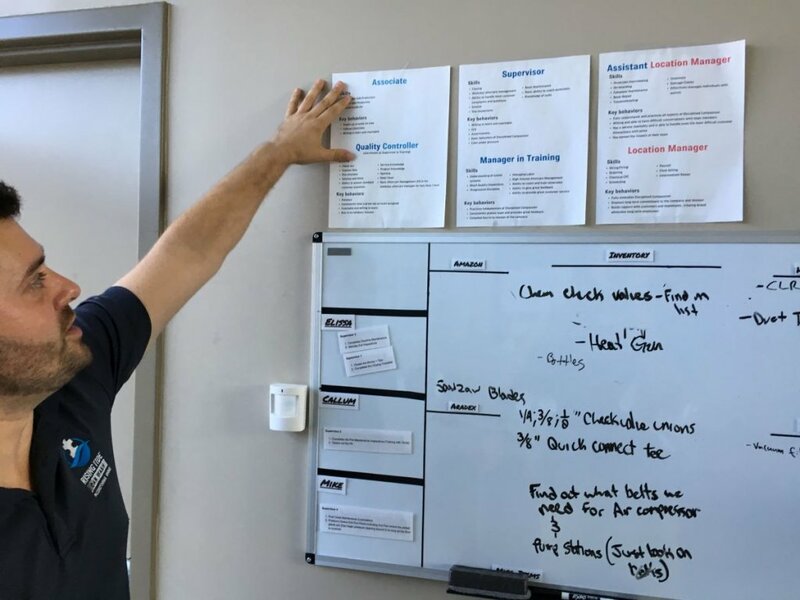 Jobs, volunteer work, household chores, working out at the gym, all were put on the weekly schedule so he would know what to expect. She notes her son’s strengths and his ability to “do things in small chunks.” Mom felt he can do a lot but an 8-hour work day wasn’t for him. 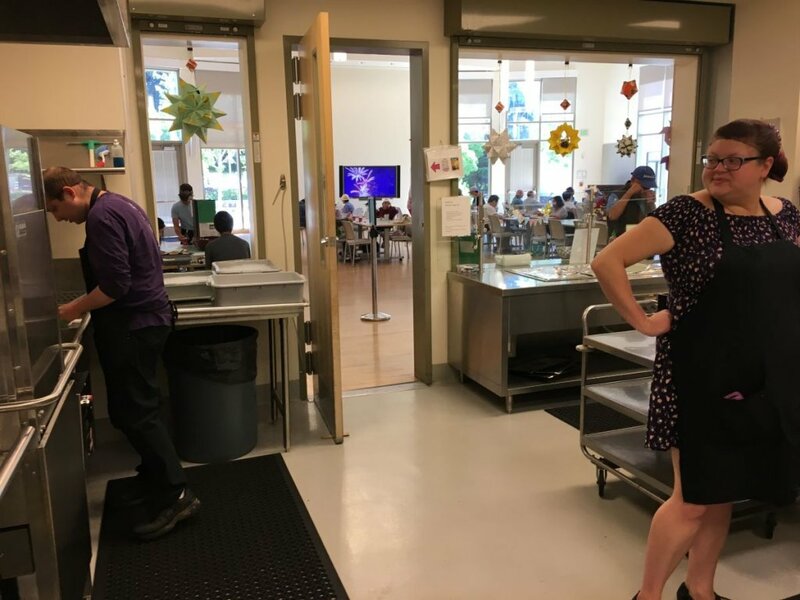 Many programs focus on the goal of full time employment and meaningful independence but those goals are a bit out of reach for Alex. Joanna says her plan has been to focus on “micro local things” since geography and traffic and transportation can huge issues in Silicon Valley. One idea she has is to create a work force of people like her son who can go in to local small businesses a few hours per week to do things like shredding, filing, sweeping, picking up lunch orders, running errands like going to the post office, and other task-oriented jobs-. 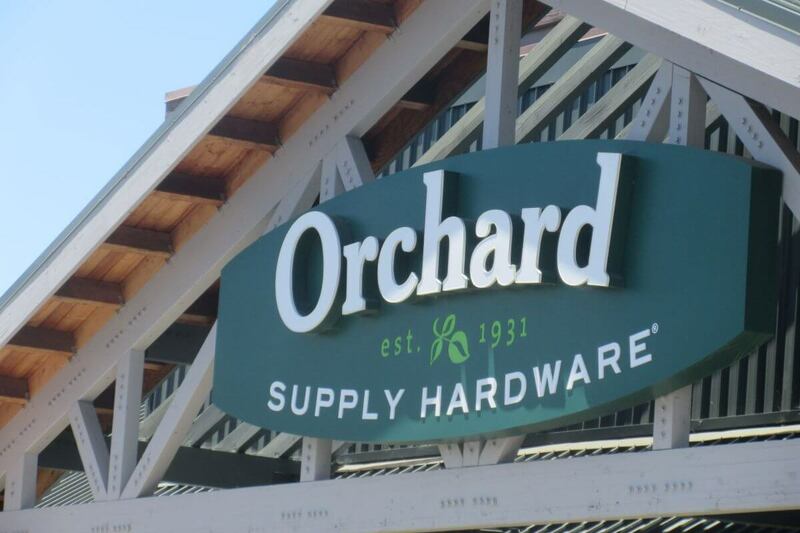 She notes that there are many businesses clustered in one area (a strip mall or office complex) where there might be lots of little jobs that no one is really competing for. Lots of places have those kinds of jobs. They can go and become a support crew for all the businesses. 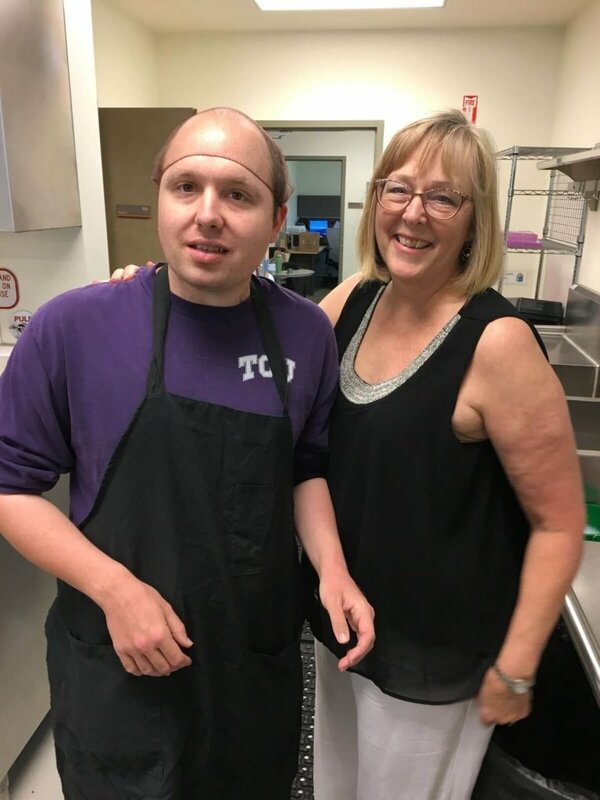 If disbursed, one to each business, each employer gets to know the person and his or her capabilities.” A support person could probably provide support and transportation for a small group of individuals with disabilities and maybe some of those people might end up being hired directly by one of the businesses they support. Alex has always had beautiful printing so we decided to expand our products to include greeting cards and art work in addition to the toffee, that features his beautiful calligraphy. 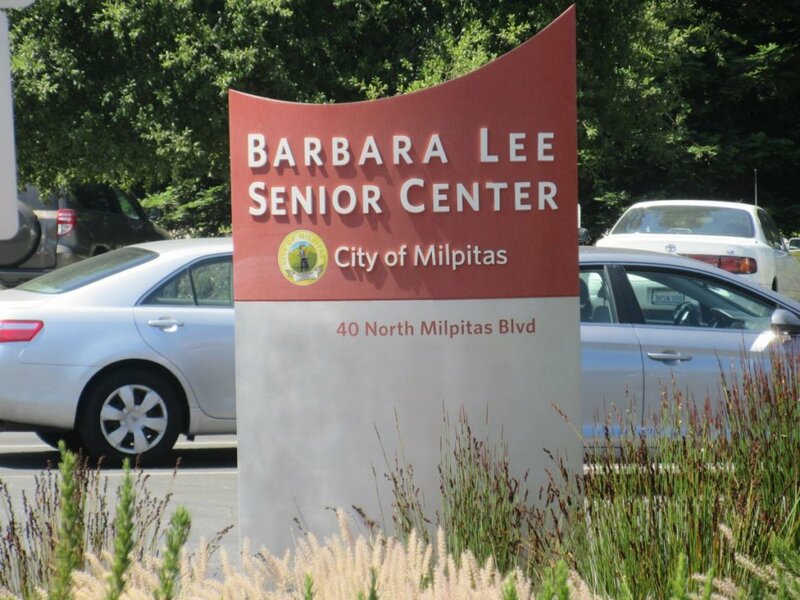 Description of Visit/Interview with mother: I met Joanna at the senior citizens’ multi-service center near their home in Milpitas, CA. We met in the garden as Alex, age 25, prepared to serve lunch to the participants who were mostly elderly Asians. 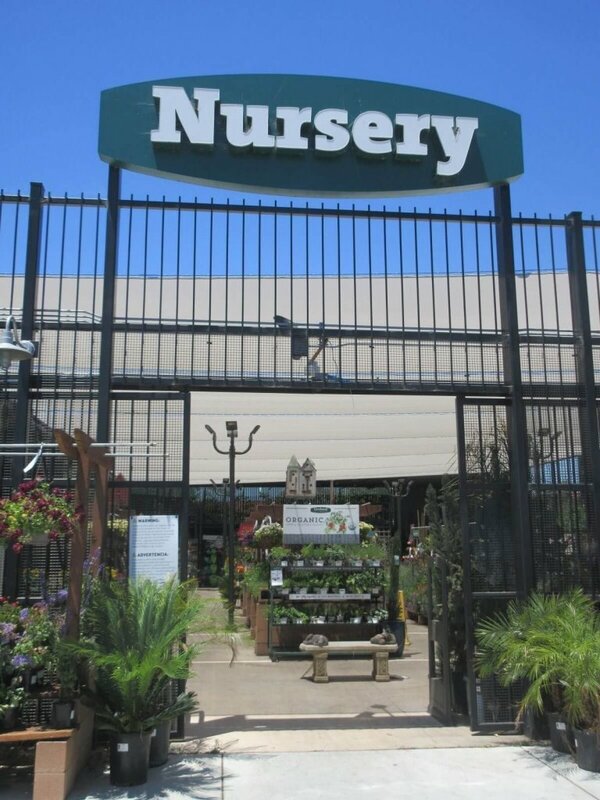 After the interview, I observed Alex in the kitchen, met his job coach, Kelly, then walked across the street to observe the garden store where Alex works an additional day per week. -She has found it helpful when looking for job coach/support staff to advertise for a Personal/Family Assistant rather that looking for someone with specific disability experience. This has allowed them to meet a broader range of people and build variety and flexibility into Alex’s program. -Basic self-care and management (toileting, hygiene, following simple instructions, not running off) are important to get in place as you prepare your child for employment and other community participation. These simple things can be real barriers to success if not addressed early. -Really focus on all the things your child CAN do. So many systems and supports are focused on deficits and needs so sometimes it is hard to shift gears to bring attention to your child’s strengths. 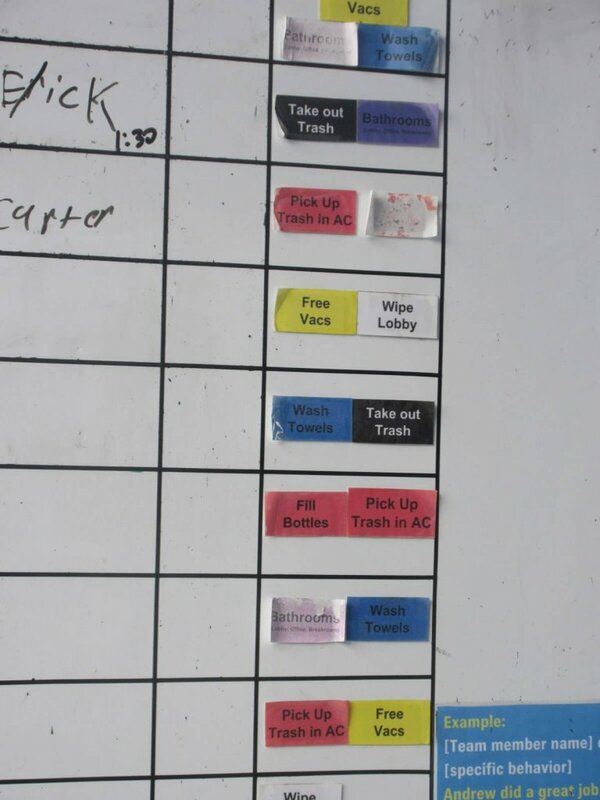 Do an inventory of all the little things they can do, household chores, computer skills, etc. and also note their characteristic that would make them a valued employee or volunteer like attention to detail, reliability, desire to please, etc. You know your child better than anyone. -Look at school and in your neighborhood for the little jobs that no one wants to do or don’t get around to. Each individual task is a job (set up chessboards for one of the teachers in his old school; filed sheet music for music teacher). Friends and neighbors bring us bags of their papers that need shredding and we charge them $10/bag. Does a dog need walking or plants need watering? Household chores can translate into jobs outside the home. -Many employers might want to hire people with disabilities but are afraid and need to be encouraged and prepared and supported. Sometimes minor changes in a workplace can make a huge difference in their ability to be successful. Joanna points out that we wouldn’t fire a typical employee for such a behavior or for a “small mistake” like spilling coffee on someone while serving (Alex never has, but others have done this). Sometimes the reaction is, if a person with disabilities makes a mistake, we never let them have the opportunity to do it again. I, for one, have burned garlic bread many times! You would never say I am never allowed to use oven anymore! -Just do it! Wherever you go every day (i.e. small businesses), scope it out, talk to people…find or create a job! There are small business owners may have jobs they are not getting to. The “gig economy” opens up some of these possibilities. 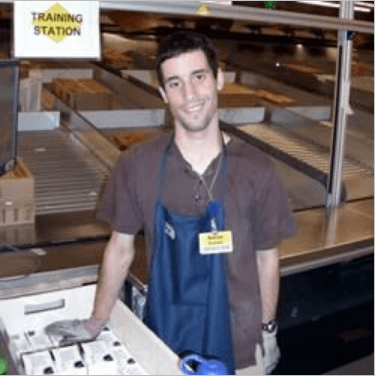 One thing that inspired me was a YouTube video—about a profoundly disabled young man—he was an errand boy for his neighborhood—he went to each shop, and said, “Hello, do you need anything? 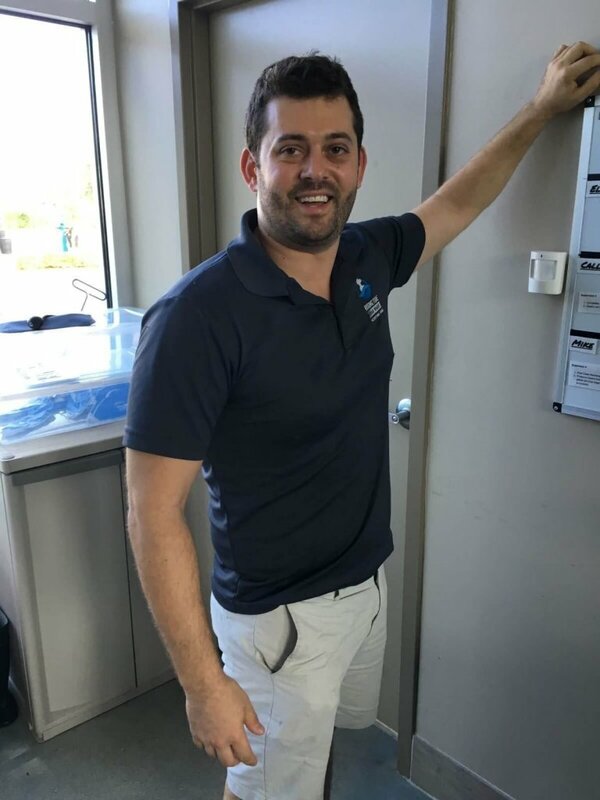 “ (Post office, pick up dry cleaning… (concierge type services) He became a welcomed and valued part of the community with many people who cared about him and gave him opportunities to be helpful. Maybe even approach your local Chamber of Commerce to see if you can talk to local business leaders about the possibility of giving your child an opportunity to work. Volunteering in the community is a great way to build skills and develop relationships. Churches, parks and recreation programs, non-profits and schools are all good places to look. How did it start and grow? It started with a business plan. They surveyed the area and considered such businesses as a cleaners and a juice shop. They ultimately decided on a car wash. 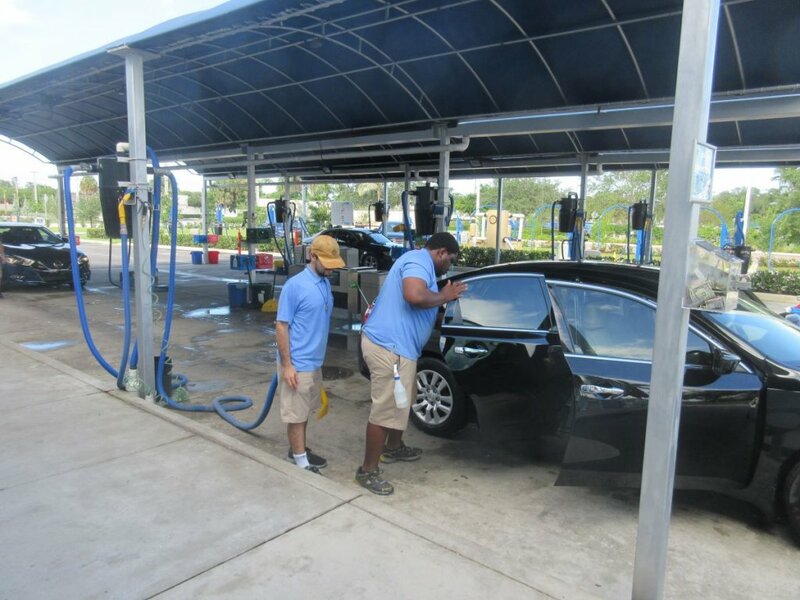 They felt a car wash in South Florida, on a road with many stores, had potential for success as a business. They would then find a way to incorporate people with disabilities in to the businesses. As is noted in the “lessons learned” section below, this systemic, research-based approach is very different from some businesses started by “desperate parents” who felt they were running out of time in finding a job for their child. 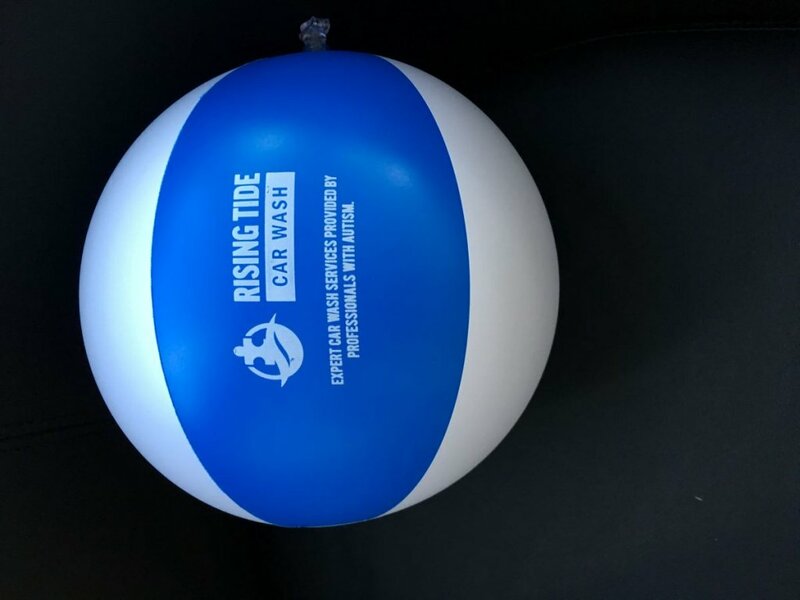 Rising Tide Car Wash has expanded to include the tuition-based Rising Tide U online learning program and the Autism Advantage podcast which has been broadcasting two years and featuring interviews with entrepreneurs who have started similar businesses. 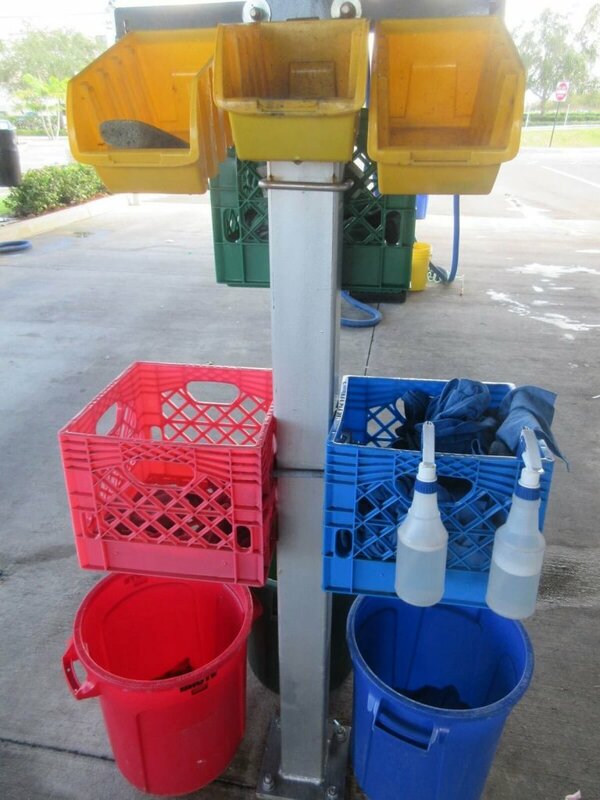 There are 92 total employees at the two carwashes and 72 have autism. Hours are flexible, ranging from 4 to 9 for all jobs. Starting pay is $8.43 plus tips, which average $2-3 per hour. After a year, there is an opportunity for a merit-based raise to an average of $10/hour. Some people with disabilities are promoted to managers after demonstrating competence in such aspects of the job as using tools for fixing things like broken vacuums. 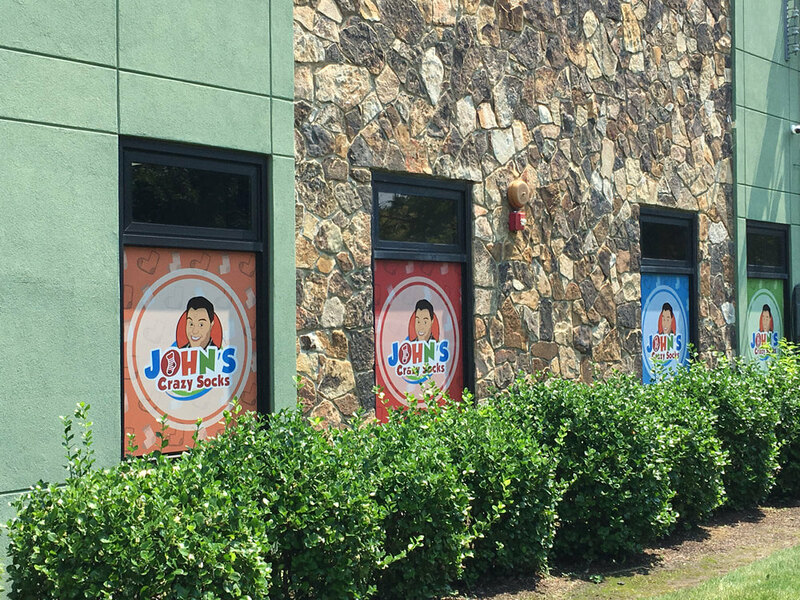 -“We underestimated the complexity of the business model we started”—it often takes 3-7 years from the time a person options the property until the doors are open. 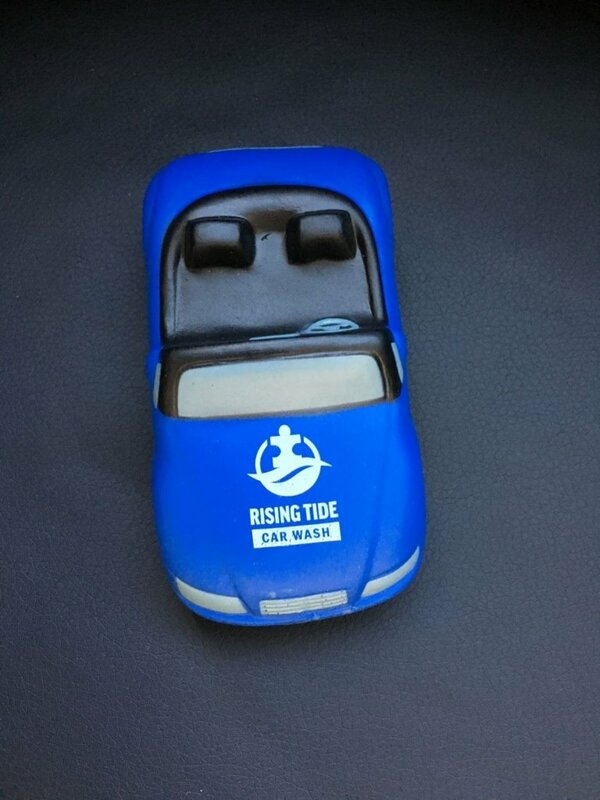 [It took Rising Tide 3 years!]. There are things to consider like environmental regulations and other laws. -There is a need for systematic learning about how to start and run a business: following media attention after the first few years in business, there were many “inbound questions” from families asking “how do you do it?’ Rising Car Wash turned to the Center for Autism Related Disabilities at the University of Miami and asked them to write a grant, which they received from the Taft Foundation. They started Rising Tide U and thus far, 18 who have taken the course have started businesses, resulting in 120 jobs created for PwD. -a “Subscription Model” where people pay for tools as opposed to an entire course may be a useful next step for Rising Tide U. -Funders no longer want to fund social enterprises since there are so many failures. They now want to pilot programs at bigger, more established companies. -There are completive advantages to hiring people with autism (see “7 Autism Advantages here: http://risingtideu.com/; also, listen to Autism Advantage podcasts). We need to help businesses understand the business advantages of hiring people with autism. 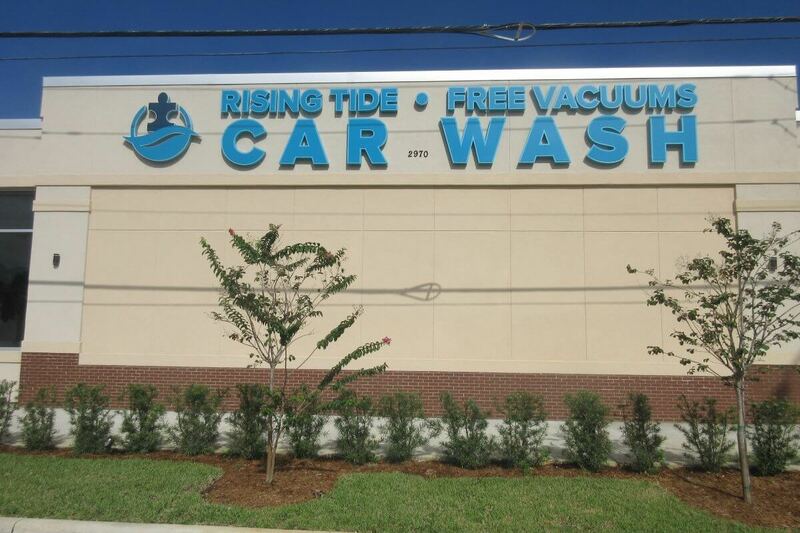 -Offer flexible hours (at Rising Tide Car Wash, people work between 4 and 9 hours). -It is an interesting time for disabilities employment because the unemployment rate is so low. Studies are saying entry level jobs ae the hardest to fill now. -We are aware of issues around Social Security; we sometimes refer people to a benefits planner. (some take a “hit” on Social Security, but are fine as long as they don’t lose Medicaid benefits). -We have learned that some of our employees with disabilities from lower income families are the primary breadwinners in their families. The Jewish Tennis Project is a nonprofit foundation that seeks to provide participants with the opportunity to train and reach a world-class, competitive level of play, combining tennis instruction with education to instill a connection to Jewish culture and Israel. Israeli tennis legends Shlomo Glickstein and Shahar Peer continue to represent Israel and the Jewish people on and off the court. The two top players were honored at a series of events in mid-March in South Florida marking the launch of the Jewish Tennis Project (JTP). The JTP is a nonprofit foundation that seeks to provide Jewish tennis players an opportunity to train and reach a world-class, competitive level of play. 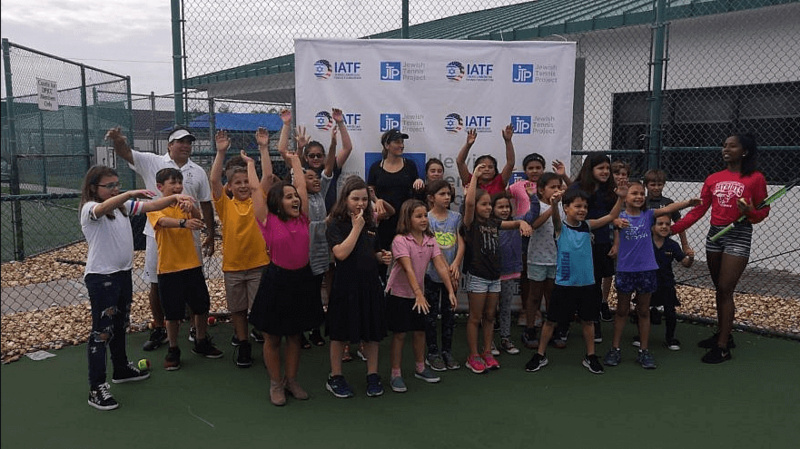 The program combines tennis instruction with high-quality education geared to instill a deep connection to Jewish culture and Israel. The idea grew out of a four-week visit to Hungary by Assaf Ingber, Israeli high-performance coach and former coach of Israeli tennis player Julia Glushko. Ingber spent a summer teaching tennis at Szarvas, a summer-camp program in Hungary that serves 1,600 children from 30 countries in a series of 12-day sessions. “I heard the kids say what it means to them and how it changed their lives,” reports Ingber, referring to the sense of Jewish identity the participants gained at the camp, immersed in Jewish living and learning. Ingber reflected on his own experience as a child athlete: “When I was a player, all I did was play tennis, only hitting the ball.” He had little time to focus on Jewish culture and identity. 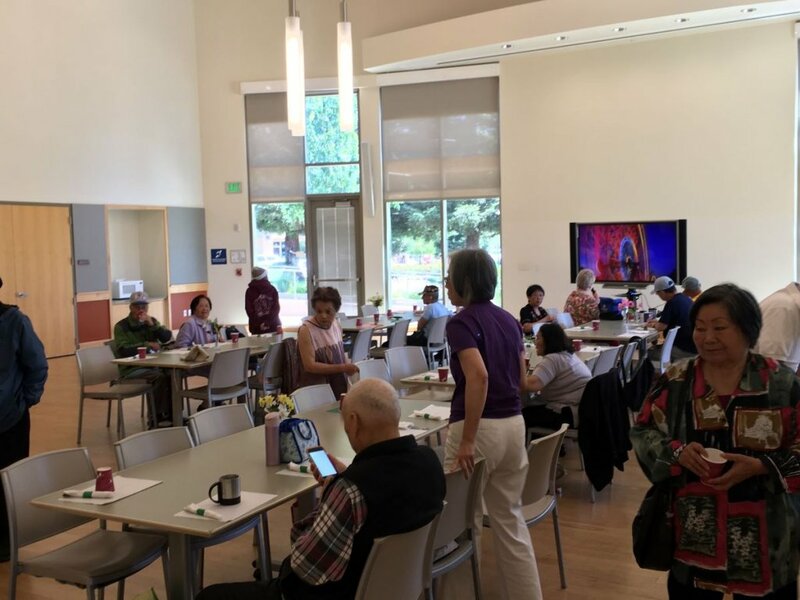 The program will initially support five or six students, including two Israelis, which Ingber feels will “help integration and make the program great.” The American students will also hear Hebrew and develop a connection with Israel. The goal of the program is to train 20 to 30 students into high-performance players in the first two years at bases in both Davie and Aventura, Fla. Programs will also take place in Mexico, Panama, Colombia and Brazil, serving a total of 500 young players at all levels. Participants will share Jewish experiences and travel to Israel. 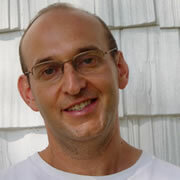 Shlomo Glickstein, who retired from professional tennis in 1988, reached a career-high singles’ ranking of World No. 22, played in all four tennis Grand Slams and reached the quarterfinals of Wimbledon in 1981, was on hand in Florida to play in a number of exhibition matches, as well as coach local children and greet supporters. He says the “weekend was monumental and historic,” as it not only brought the top two Israeli tennis legends on the same court, but more importantly, put smiles on the kids’ faces. JOIN US AS WE RIDE AND HIKE ISRAEL. Ramah Tikvah Programs provide meaningful summer camp experiences for children, teens, and young adults with disabilities. This event will be From 2- 9 April.